Easy to use and reliable professional digital crane scales, for weighing in industrial environments, fitted with protective transport case. Thanks to their compact size, the MCWN crane scales just slightly reduce the lifting distance of the crane. Available also CE-M APPROVED. 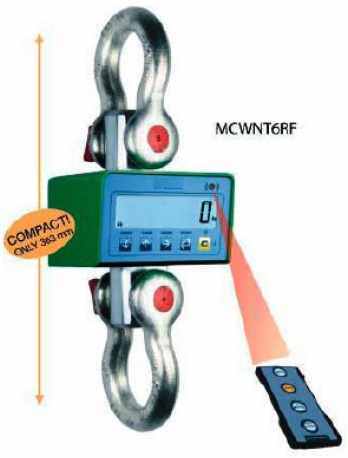 The MCWN crane scales are standard fitted with a radio frequency communication module, for connection to PC, remote printer, or weight repeater. Fitted with protective transport case with dimensions 410x260x240mm (w x l x h). Hold, for freezing the weight on the display. Peak, for identifying the weight peaks. X 10 high resolution visualisation.